Bubblegum, peardrop, lemon, lavender, coconut, orange, floral, pineapple and cherry. For general use as an effective deodoriser and disinfectant dilute at rate of 1: 30 to 200 with water. Apply by spraying. For extreme odour problems use product neat. 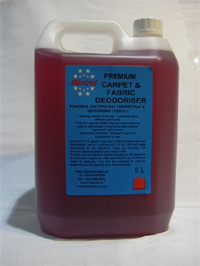 Concentrate can be added to carpet shampoo in the reservoir of extraction machines. Add about 30mls per 5 litres of water in reservoir. This can be increased or reduced depending on the desired level of deodorising.